After months of negotiations and planning, Apple finally moved iCloud Data of all Chinese users to state-owned servers. The news that this was where the company was heading, of course, was greeted with great opposition and discontent from Apple users and human-rights activists, but, ultimately, the company had no choice but to obey the law. From now on, all data is stored on the servers of Guizhou-Cloud Big Data (GCBD), Apple’s iCloud partner in China. What does this mean for the virtual security of Apple users, and what can they do to strengthen it. These are the topics we focus on this report. China is the land of 1.4 billion people, according to the World Population Review. It is the third largest country in the world, and the World Economy Ranking data shows that it is the second strongest country economically. Needless to say, China gets to make its own rules. The long history of the country has formed many beautiful traditions; however, it has also consolidated strict censorship, huge state power, and unquestionable obedience that is expected from everyone. Unfortunately, the Chinese government is not moving towards a more liberal rule. Instead, it appears that it is tightening its grip even more. In late 2016, the government embraced a new set of regulations that would help broaden the spectrum of censorship in the country. The laws were targeted at companies handling user data. The Chinese cybersecurity laws are introduced to the public as laws that would protect the virtual security. But is that the reality? Although, officially, these new regulations are set up to fight cyber terrorism and hacking, the human rights-advocates fear that this is just a disguise to justify censorship and close monitoring of the public. The regulations can be used to force users to reveal their names and private data when they register for new services, which means that virtual anonymity goes out the window. The most important regulation, however, is that data now needs to be localized within China. This means that companies like Apple are now forced to transfer data if it is stored in servers outside China. According to The Hacker News, Apple started the migration of data by transferring the encryption keys and some data to the servers of Guizhou-Cloud Big Data (or GCBD) back in February, earlier this year. In the latest data move, Apple transferred personal user information to the Tianyi cloud storage service, and Tianyi is controlled by China Telecom, a state-owned telecommunications company. Some of the data that was transferred includes emails, text messages, and encryption keys. 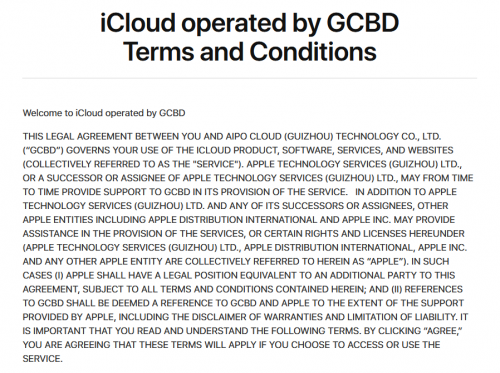 According to the Terms and Conditions statement created by Apple, GCBD monitors how Apple users use iCloud services, and it also has complete control over the data that is stored. It is most disconcerting that data can be shared, exchanged, and disclosed without notifying the user. Yes, data is encrypted, but, as we mentioned already, the encryption keys have been transferred to the Chinese servers as well. Technically, all iCloud data is protected and safe, but there is a huge concern that, in reality, it could be monitored by the government. What Apple users can do to protect their data? Since Chinese censorship and data monitoring is not exactly a new thing, Internet users in China have been doing things to avoid all that long before the new regulations came in. According to Council on Foreign Relations, Chinese users employ software (e.g., Ultrasurf, Psiphon, and Freegate) and VPNs, insert IP addresses into host files, use the anonymous Tor browser, as well as turn to using SSH tunnels to redirect traffic via remote servers. Statistics show that up to 8% of all Internet users in China are using VPNs and proxy servers to get around firewalls. There is one more trick that Apple users in China can use, and that is to delete their accounts and set them up anew. During the setup, a different host location can be chosen, and that would automatically transfer data to a server that is outside of China. For now, that is the best bet Chinese iCloud users have; at least, until more is known about the government’s interference. Albert, E. and Xu, B. 2017, February 17. Media Censorship in China. Council on Foreign Relations. Apple Legal. 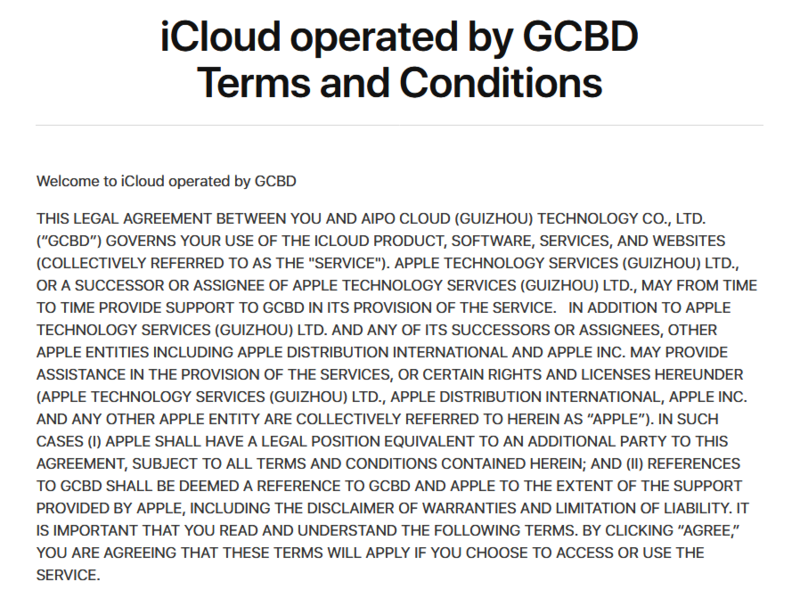 iCloud operated by GCBD Terms and Conditions. Apple. Husseini, T. 2018, June 6. 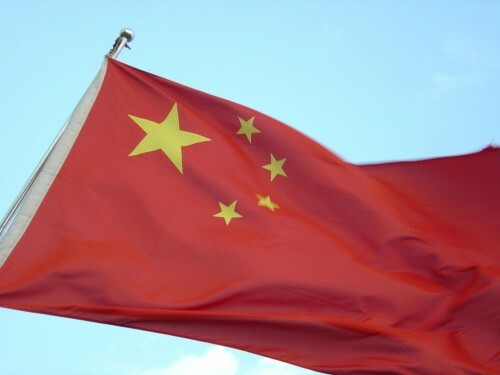 Apple Transfers Chinese Users' iCloud Data to State-Controlled Data Centers. The Hacker News. Kumar, M. 2018, July 18. World Economy Ranking: 2018’s largest economies and the top tech hubs driving growth. Verdict. World Population Review. China Population 2018. World Population Review.